"Photo courtesy of News and Publications", on the "Royal Purple" website. The University of Wisconsin-Whitewater (UWW) is located near Milwaukee and Madison. Wisconsin's second normal school was opened on 21 April 1868 in the village of Whitewater, with 39 students and nine faculty members. It was then called the Whitewater Normal School, a name later changed to Whitewater State Teachers College (1927), Wisconsin State College-Whitewater (1951), Wisconsin State University-Whitewater (1964) and eventually to The University of Wisconsin-Whitewater (1971). In 1951, the College became a multi-purpose institution by offering liberal arts studies to go along with teacher education. Enrollment for this year is 10,447 students and 1,077 employees, including 391 academic staff. 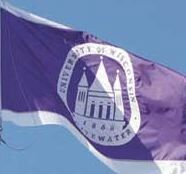 In "Royal Purple", 8 November 2006, Greg Ylvisaker reports the adoption of the first flag of the University of Wisconsin-Whitewater. The flag is purple with two thin white edges on top and bottom and the emblem of the UWW in the middle. The flag was designed by Daniel Kim, Assistant Professor of Art, who said that "the two white lines on the campus flag represent an equal sign, a connection, as well as a balance." The flag is flying over the visitor's center on campus and will be lowered in the event of the death of a student or faculty member.